The Link is a graphically pleasing slots online 5 reel designed to relax you while you’re playing for the big bucks. The icons on the reels look surprisingly like the buttons on a PlayStation controller but perhaps that adds draw to the game. Spin today and surprise yourself with all the things you can win. Gamevy was founded in 2013 and even though they haven't been around as long as most of the market leaders they have already proven themselves to deliver high-quality and innovative on line slots. The art-style always looks very polished and the design choices are well done providing games with an excellent game feel. Their products offer fun and engagement in games where player choices or skill really matter. Gamevy offers completely different games to anything else in the real-money market, developing engaging gameplay experiences for their audience. The link is a beautiful and simple video slot that will provide a nice gameplay experience. The background is a very dark blue shade with glowing particles that are nicely floating around. It reminds a little of either a very deep underwater scenery or something in space. The animations are gorgeous and very intriguing. There is no specific theme to this video slot as everything is just made out of shapes. The art-style is super polished and everything is nice and glowy. The reels occupy the center of the screen and are see through so you can admire the beautiful background at all times. The playing controls are on the right side and on the left side you can find the options and menu icon to find out more about the game. All user interface elements will disappear from the screen once you hit the play button so you can see the reels spin rapidly on the screen and focus entirely on your game. On the three reels and three rows are only five symbols. A glowing green circle, a red triangle, a metallic blue square, a silver glowing diamond shape and a dark purple cross. There are no bonus symbols, but there is a yellow star wild that will substitute for any other symbol to form winning combinations. 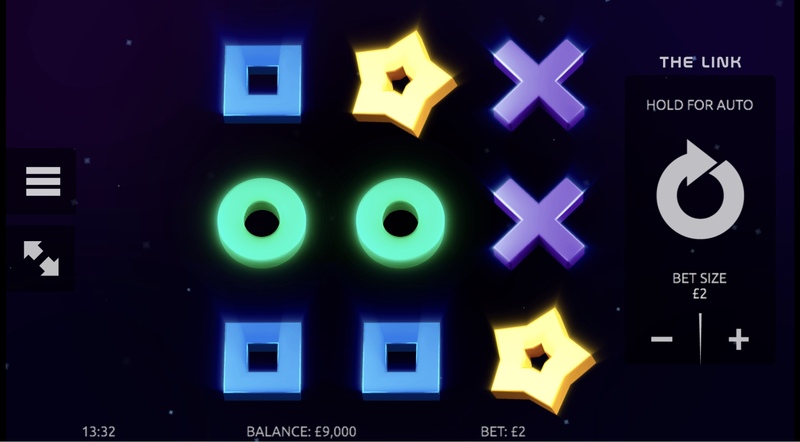 The star can win on multiple lines and substitute for one or more symbols at once, increasing your winning chances. There are 8 paylines and you can form winning combinations by matching three identical symbols on a horizontal, vertical or diagonal line. To try a spin yourself you will have to place a minimum bet of 1 pound or up to 10 pounds. We also often run various slot promotions with this game. The Link is simple and absolutely gorgeous. It has very few reels and not many paylines but the wild can help forming winning combinations very often turning your spin very profitable for you. The mechanics are easy and you will quickly understand how to play it and immerse yourself into the game flow. The art style is also simplistic but very well done and polished turning this game even more engaging. 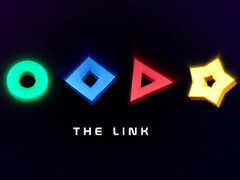 The Link is another well done game by Gamevy which represent well the usual quality and innovative design this company has to offer. Our most popular game is Cops & Robbers Slots. Find more Easy slot games.